Is Leatherface a Girl in the Texas Chainsaw Prequel? Last April, new details about the long-awaited Texas Chainsaw Massacre prequel Leatherface were revealed, teasing the plot has quite the interesting twist. In March, it was reported that British actor Sam Strike had been cast as the title character, but it was later explained that he is actually playing one of four characters who could be Leatherface. Last week, producer Christa Campbell revealed the first photo from this horror prequel, which hints that Leatherface may actually be a young girl. Sam Strike is joined by Sam Coleman, James Bloor and Jessica Madsen as the four teenagers who escape from a mental institution, all of whom have an affinity for wielding chainsaws. They kidnap a young nurse (Vanessa Grasse) as they make their escape, with a local sheriff (Stephen Dorff) trying to track them down. By the end of the movie, one of these teenagers will ultimately be revealed as Leatherface. This new photo courtesy of Christa Campbell's Instagram account gives us our first look at Jessica Madsen's character, who may very well end up being Leatherface, as she is playing one of the inmates at the heart of this mystery. 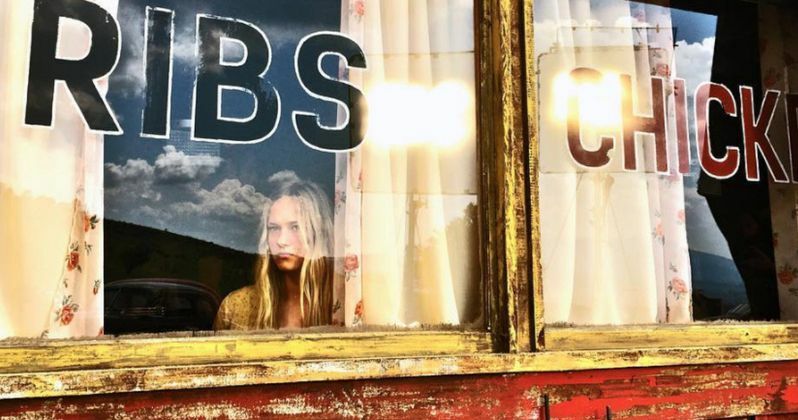 The photo features Jessica Madsen's character looking out from a barbecue restaurant, which could very well be the Gulf Oil gas station and BBQ restaurant that was featured in the original Texas Chainsaw Massacre. Ironically, the site of the original BBQ restaurant, the Last Chance Gas Station in Bastrop, Texas, is being turned into a Texas Chainsaw Massacre resort, which is reportedly set to open in mid-July. It isn't known if this site was used for Leatherface or not, which is set in the 1970s, although a specific year hasn't been given for the prequel. Of course, we won't find out for sure which of these four characters will become Leatherface until the movie hits theaters. But there hasn't been a release date set at this time. The supporting cast includes Angela Bettis as the Sawyer matriarch and Lili Taylor in an unspecified role. Leatherface is currently in post-production. With the release of this photo, perhaps the first trailer is just around the corner. And would it be so surprising if Leatherface was revealed as a girl? Gender-swapping is a popular trend nowadays. You need look no further than the Ghostbusters reboot, which features an all-girl line-up of haint hunters, or The Mummy reboot, which turns the title monster into an ancient princess, to see that is true. Julien Maury and Alexandre Bustillo (Among the Living) are directing the Leatherface prequel from a script by Seth M. Sherwood. Hopefully we'll be getting more photos from producer Christa Campbell as post-production continues on Leatherface, revealing the other teenage psychopaths who may or may not be Leatherface. We'll be sure to keep you posted with more updates on Leatherface, but until then, check out the first photo below.